Br. 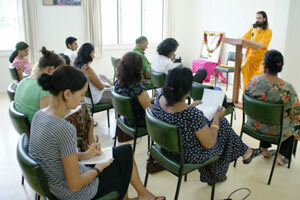 Shantamrita presented a Conscious Living Workshop in the capital of the Fiji Islands, Suva on Saturday March 12 to an enthusiastic group of people. 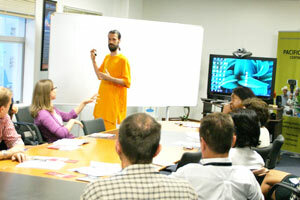 In the three-hour workshop held at the Pacific Theological College, Br. 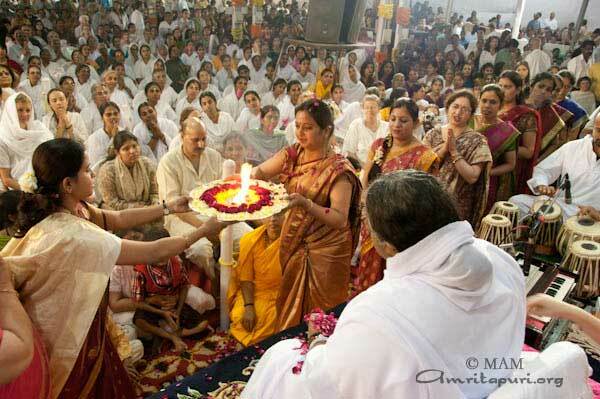 Shantamrita examined the obstacles in life that prevent us from reaching our full potential in spiritual and worldly matters such as self-doubt, negativity, ignorance, and lack of awareness, and offered practical solutions to overcome these obstacles. 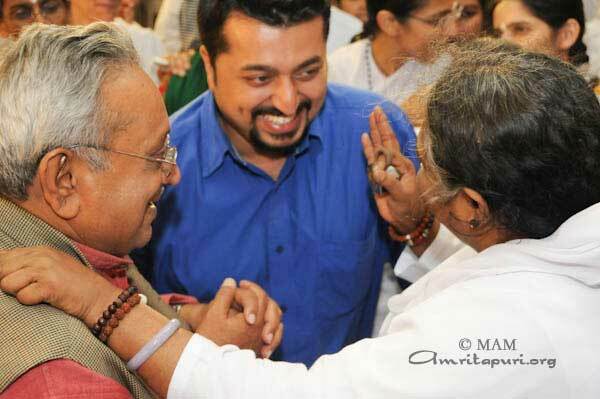 He also led the participants through the principles for self-transformation through awareness. The workshop had group discussion on certain issues and also finished with a question and answer session. 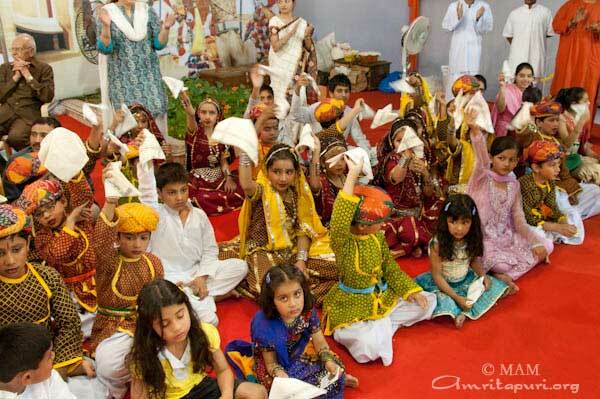 All the participants were extremely satisfied with the workshop. Br. Shantamrita Chaitanya carried out a workshop for United Nations staff based in capital Suva, Fiji, entitled “Achieving a Work Life Balance: A holistic approach” at the UN’s request. 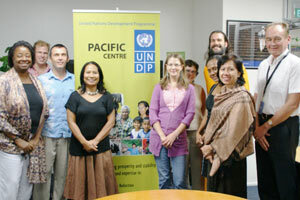 The workshop was held at the United Nations Development Programme Pacific Centre’s office on March 10, and the participants were from a range of United Nations agencies in Suva, including the Director of the Pacific Centre. 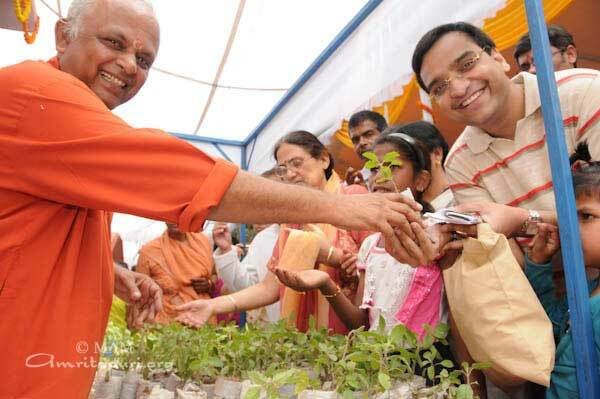 Shantamrita introduced concepts and techniques aiming to improve not only the abilities of the UN staff to manage complex projects, but also their ability to deal with the multiple demands of their personal lives in order to achieve a holistic success. Seeing life as a whole rather than divided in to personal and professional, and both the workplace and the home as places to grow spiritually and professionally was a theme that UN staff found refreshing in the interactive workshop. The participants commented that they felt better equipped to deal with stress, handle personal and professional demands, and grow spiritually and in their careers. 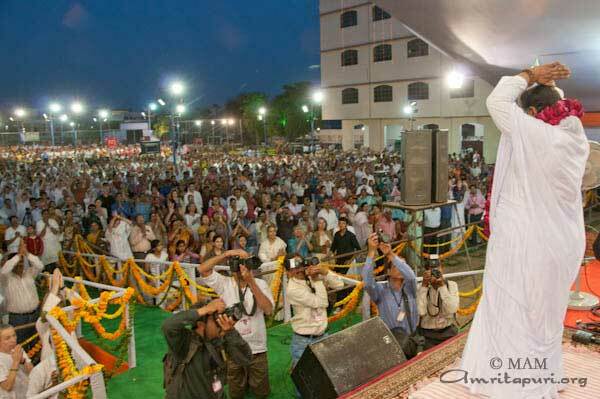 Delhi, the capital of India, is the last stop of Amma’s programs in North India this year. 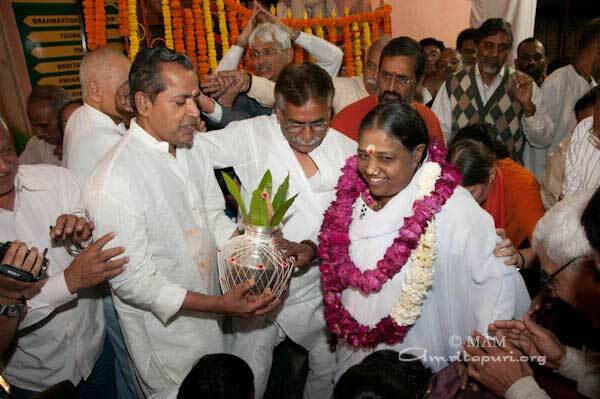 The Brahmasthanam temple in Vasant Kunj at the Delhi branch-ashram, was inaugurated by Amma back in 1995. 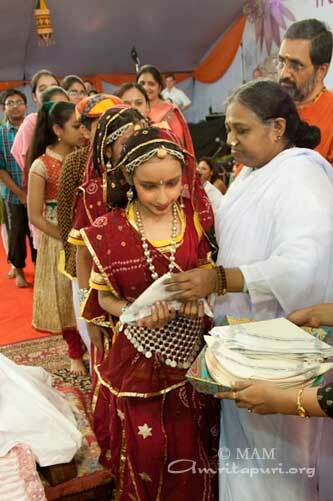 Since then, She has graced the capital with her presence almost every year holding annual festive celebrations. 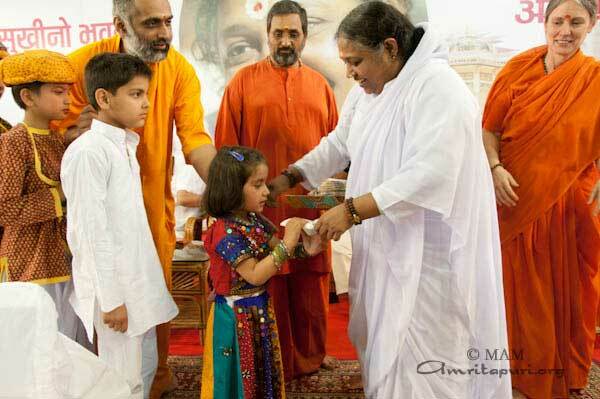 During Her visit, and as she has done everywhere else on this tour, Amma extended the ashram’s charitable activities. 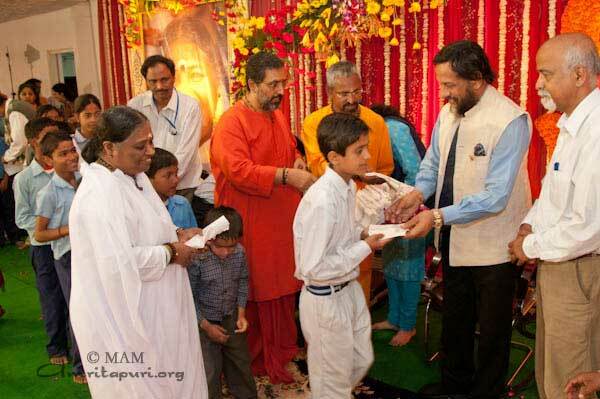 This included the distribution of Vidyamritam scholarships, the distribution of handkerchiefs for students and children as part of the Amala Bharatam Campaign in Delhi, and the blessing by Amma of Tulasi saplings as part of the AYUDH activities in the capital. 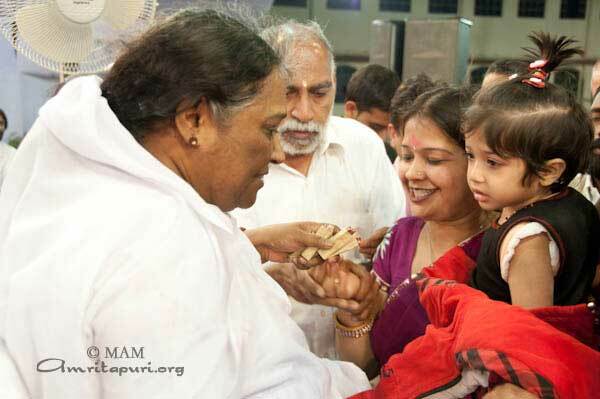 Like in the previous Hindi speaking cities part of the tour, Amma pleased the devotees by leading the Manasa Puja in the local language… A precious additional generous gift that she now grants the devotees of each place that she visits in India, bringing more happiness to their fulfilled hearts. 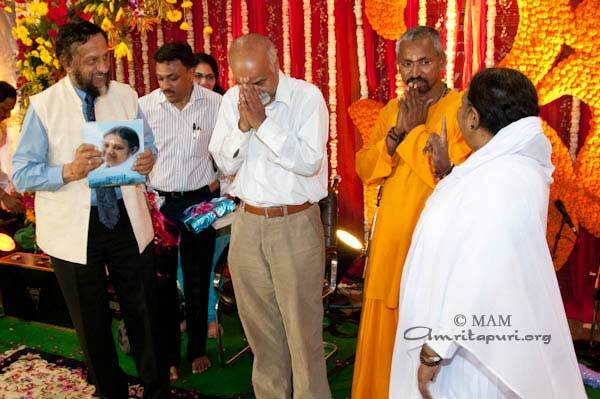 Lot of important dignitaries from different walks of life got a chance to meet Amma and receive her blessings. On the evening program of the 17th, students from the Amrita Vidyalayam, Delhi, delighted the crowd with various performances. 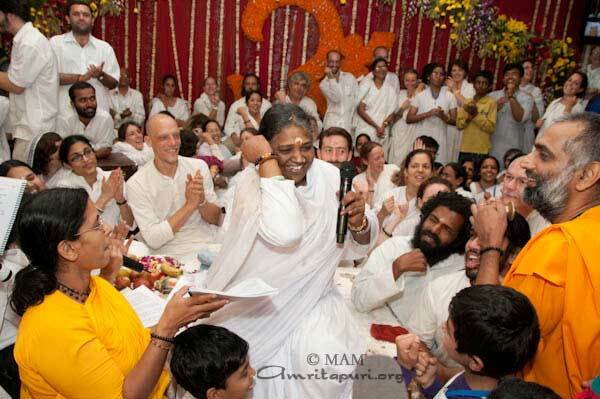 Around 5:45am, as darshan was ending, all those present gathered around Amma waiting for the special delight that she was about to offer: For the next 45 minutes, with the microphone in Her hands Amma led 2 ‘upbeat’ bhajans – ‘Hari Narayana’ in Hindi, ‘Bandalo bandalo’ in Kannada, guiding everyone into rounds of clapping, dancing, and “Jai!”-replies to her “Matarani Ki!”-calls… As Amma was swaying back and forth with hand gestures, the group also moved in the same rhythm as if in a boat race. 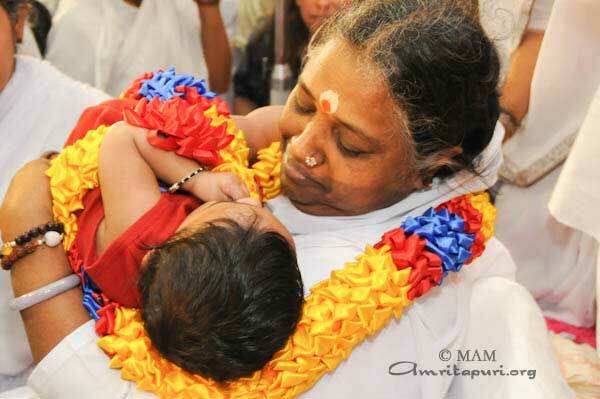 The whole hall was vibrating with full of energy, as Amma’s loving eyes were continuously scanning across the hall, with a compassionate look and a bewitching smile on her face. 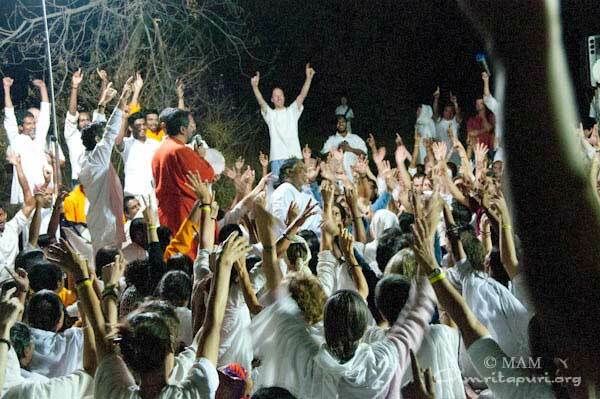 Then Amma asked every one to pray for the world peace, especially for the victims of the Japan disaster, leading all in chanting of ‘Loka Samasthah sukhino Bhavanthu’ mantra. 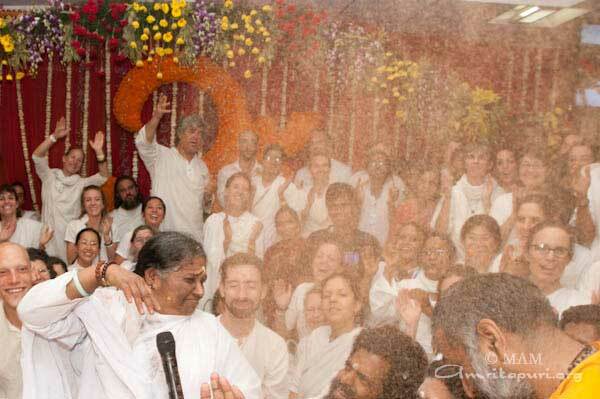 ‘Holi has come, I have filled up the water pistol’ … singing the song The “Ayee he Holi” – Amma started smearing colour powder on the face of the children standing around her. 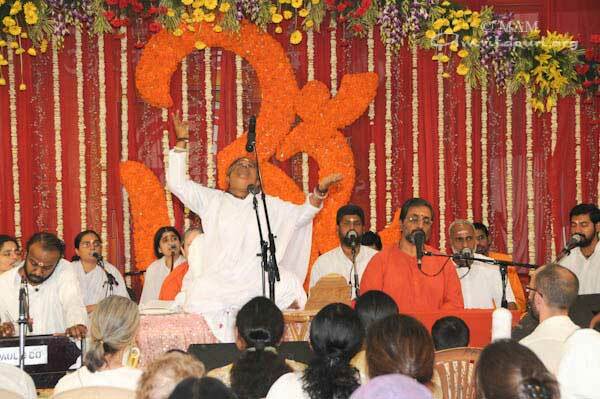 As the tempo of the song increased, Amma sprayed color powders around. 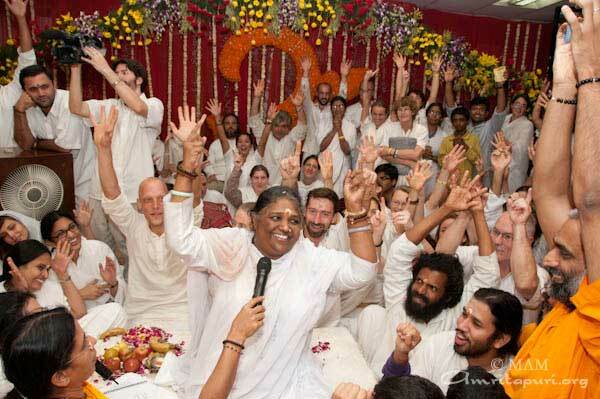 Every one was ecstatic. 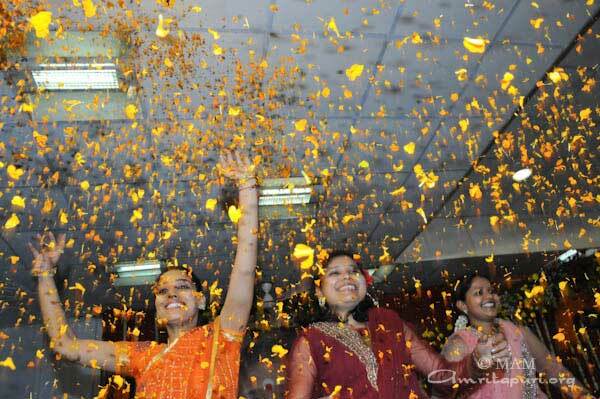 The Delhi devotees will surely paint their hearts with these colours for a long time. 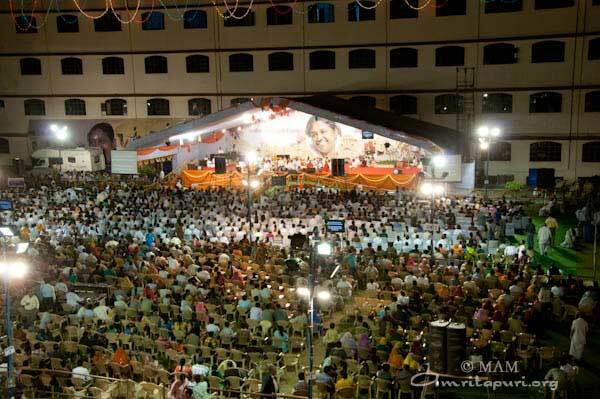 After the programs in Delhi, Amma left for Singapore-Mauritius-Reunion-Kenya tour, while most of the tour group will head back to Amritapuri, and eagerly wait, yet again, for Amma’s return there. 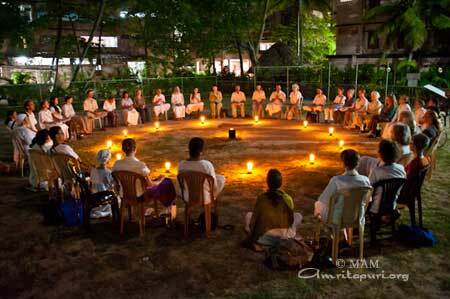 Since first day after the earthquake in Japan, there were prayer circles for the victims every day. 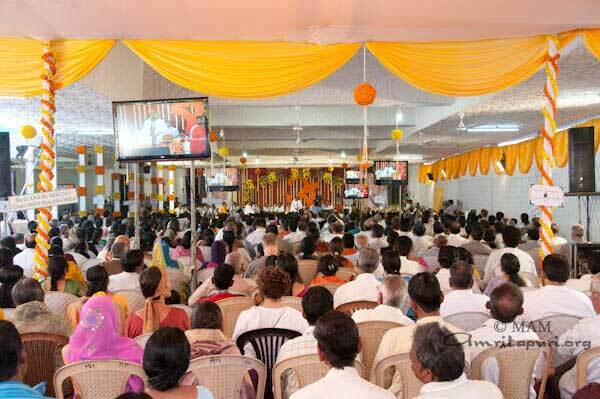 Daily after the evening bhajans, all have been chanting 108 ‘Lokah Samastha’ mantra sitting around the map of Japan with lamps lit around it. 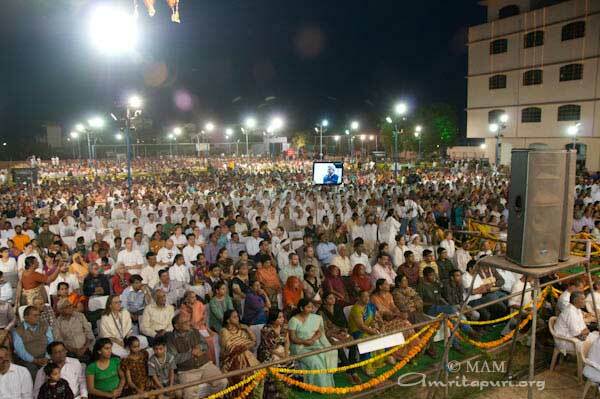 Amma’s message has been spread to the South Pacific through a visit to the Fiji Islands by Br. 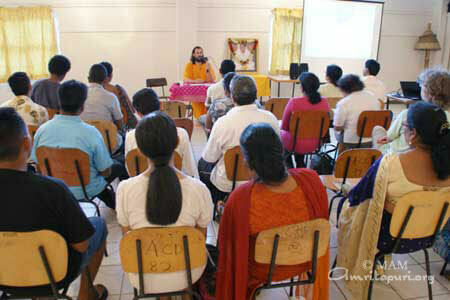 Shantamrita Chaitanya from March 7 to 14, 2011 to conduct a series of seminars on Practical Spirituality. Br. Shantamrita’s first program on March 9 was at the prestigious Fiji National University in the capital Suva where he spoke to diverse audience of indigenous Fijians, Indo-Fijians, expatriates, students, and professor’s on the topic of “The World Awaits True Leaders”. 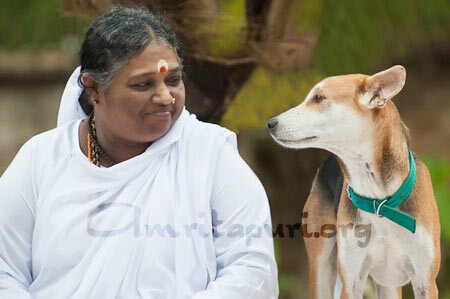 Based on Amma’s teachings Br. 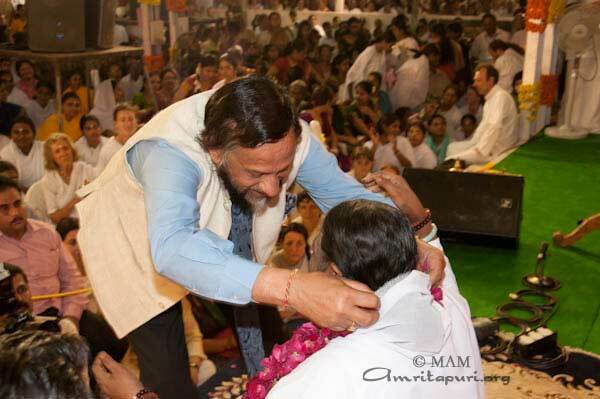 Shantamrita explained how true leaders speak through their actions, guiding and inspiring others with their love and selflessness and how such leaders, like Amma, can bring about tremendous transformation, even in today’s world. Touching on such topics, Br. 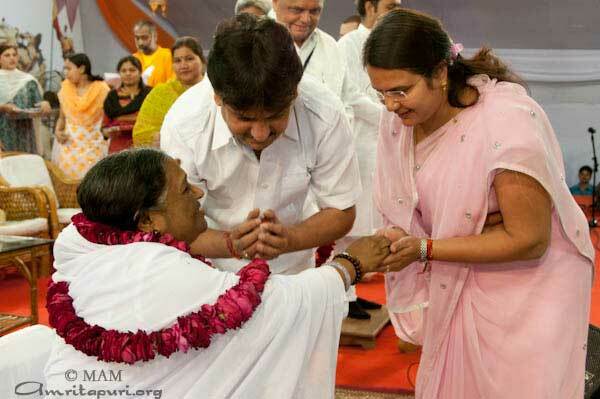 Shantamrita discussed how we can invoke our latent leadership qualities and become the change that we seek in society. 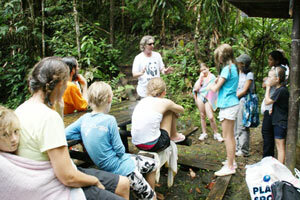 The talk was followed by a lively question and answer session. 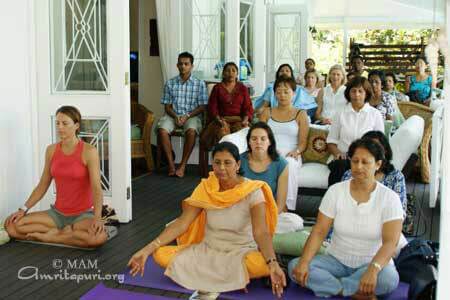 The next day Shantamrita taught meditation to a group of enthusiastic participants at a private house in Suva. 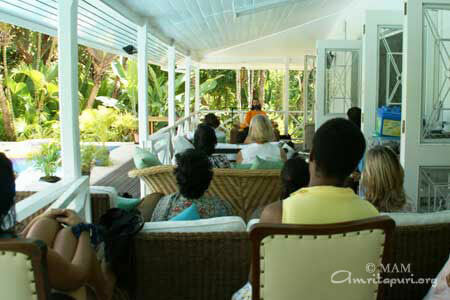 The session was held on the house verandah surrounded by a lush tropical garden creating a relaxing atmosphere for all. 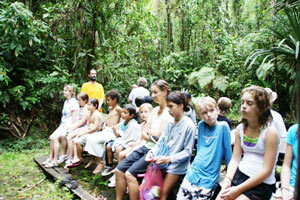 Many of the participants commented how peaceful and inspired they felt by the session. 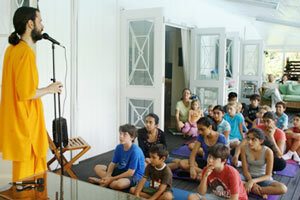 Further sessions were held during the week, including a training session for United Nations’ staff, a satsang at a large Hindu temple, a conscious living workshop, and an introduction to meditation for children at a national park just outside of Suva. 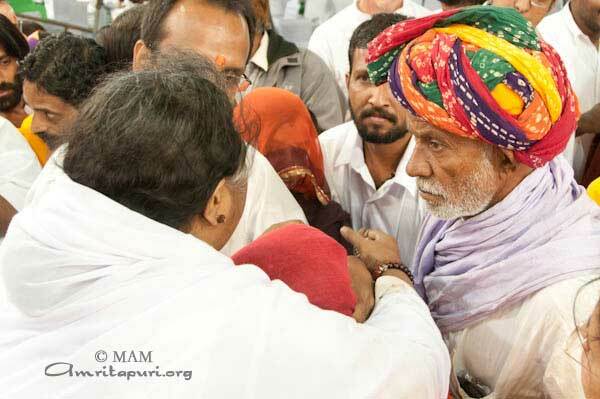 A very touching element in Amma’s tours in India is the amazing fact that she still insists on traveling by road herself and to stay with the caravan of buses that travel along. 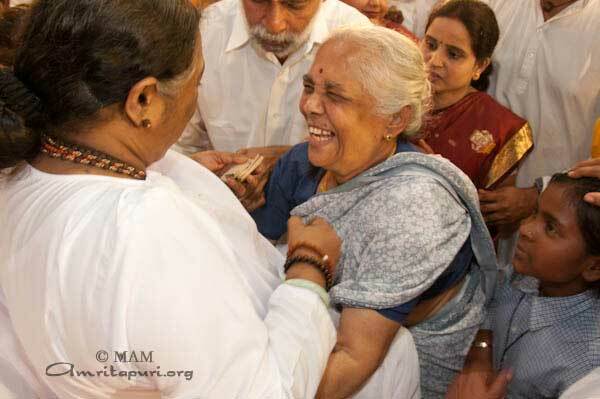 The 1-day journeys from one city to another sometimes take 20 hours, the distance to cover is sometimes over 600 km; but Amma keeps it as an unwavering rule to stick to the vehicles transporting the around 500 members of the tour. 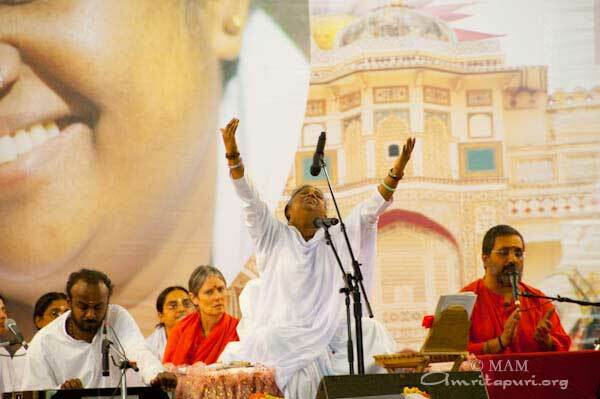 …to offer all her disciples and devotees the unforgettable memories of bhajans, satsangs, dinner moments on the side of the road, when the engines are put to rest and the drivers can recuperate from their arduous task of carrying the ‘mobile mini-ashram’ throughout the land of India. …to make sure that all is fine and everyone is coping well with the hard and long traveling, as the buses cut across rural areas, cities, small towns and villages, crossing the borders from state to state. Couldn’t Amma simply travel on her own, reaching ahead of time and allow herself some resting hours before her next program? Shouldn’t Amma simply take a train or a flight to the next destination and avoid the added discomforts of bouncing on the Indian roads? 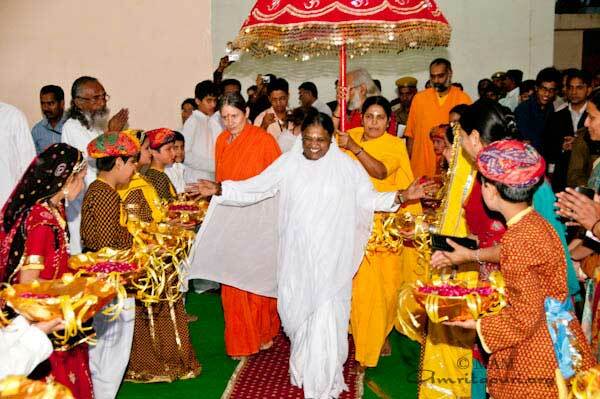 It is painful to think about these added tapas that Amma is imposing on her body, but for Amma, these tours are spiritual pilgrimages (yatras) that she fully treats as such in every detail, applying the dharma of pilgrimage firstly on herself! 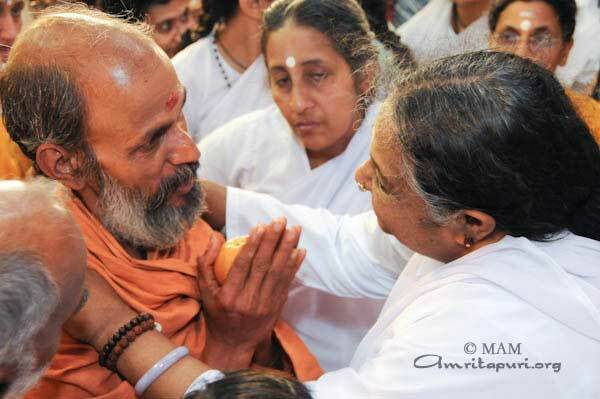 Could we imagine her not acting in this way, not forsaking her own comforts in order to please her ‘children’ and make them spiritually benefit from her presence? 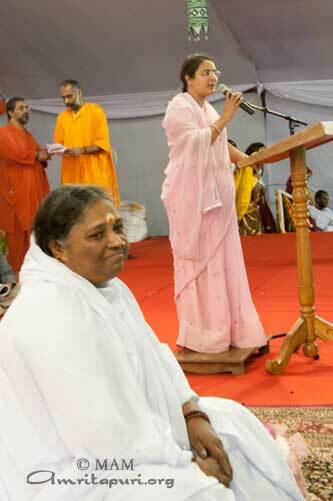 In the last two stops, Amma’s question for everyone was related to performing one’s dharma and responsibilities in the ‘material’ world while keeping a loving and compassionate attitude. 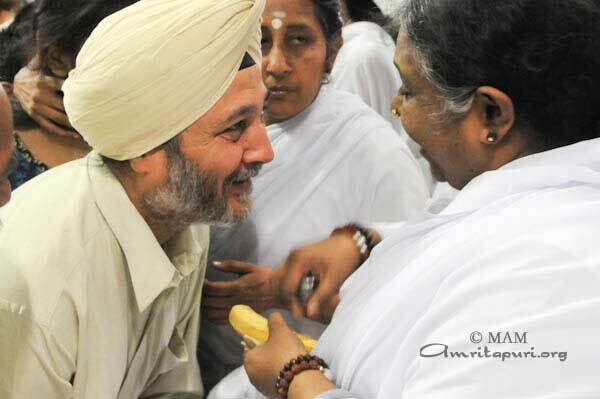 Making everyone reflect on the subject, people discuss about it in small groups and some get the chance to share their views in Amma’s presence… Slowly, after each one’s input, and often brief comments from Amma, she is leading us all closer to the best blend in this practical spiritual subject. 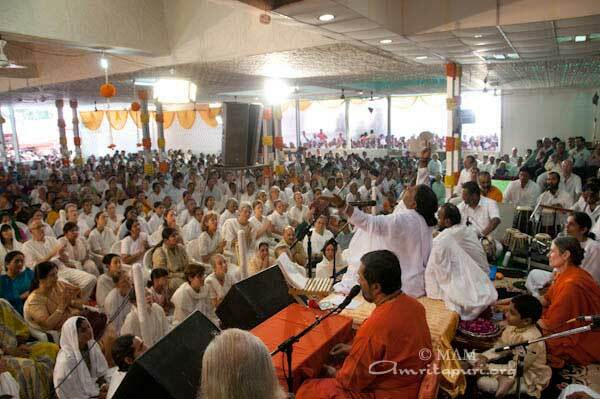 In Her last satsang Amma said, that people usually find excuses for not finding time for spiritual practices: Long working hours that consume all the day’s time and energy; preparing for a marriage; preparing for the first birth in the family; having a second child; then another child… How can they find time to care for wife or a child, when they complained that they don’t have time even when they were bachelors! 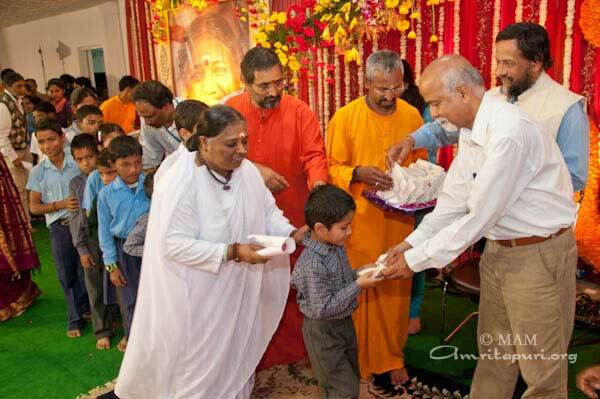 It seemed that all their time was fully booked, but how could they find time for their wife and their children” Amma asked? With only one child you were complaining that there is no time. Then when you have a second child, you find time for that child too. Now your complaint is that you have 2 children and don’t have any time. But when a 3rd child comes into the family, you find time to care for that baby too. 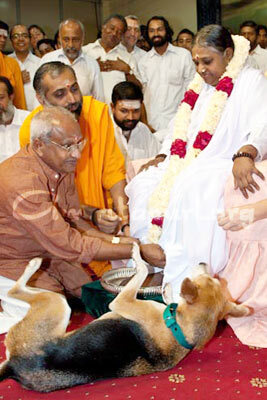 Amma wondered how is it possible. Then she said in her own typical simple but so profound and so practical way: We should treat society as another child in our family!! 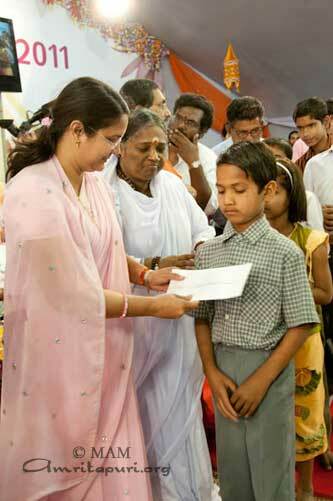 Then you will be able to care for others, show love and compassion. 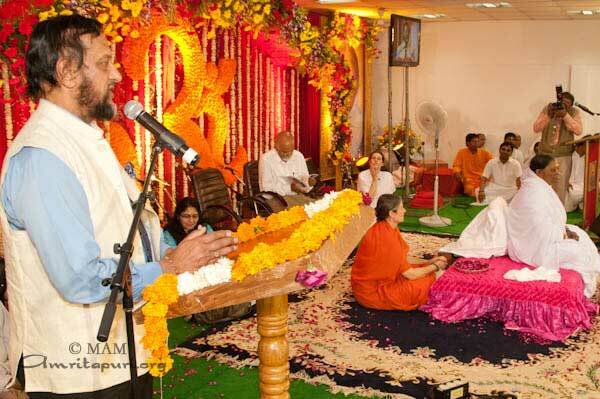 In Sanatana Dharma the creation and the creator are not two but one, like a wave and the ocean” Amma explained sitting on the roof of Amrita Vidyalayam building in Amdavad. 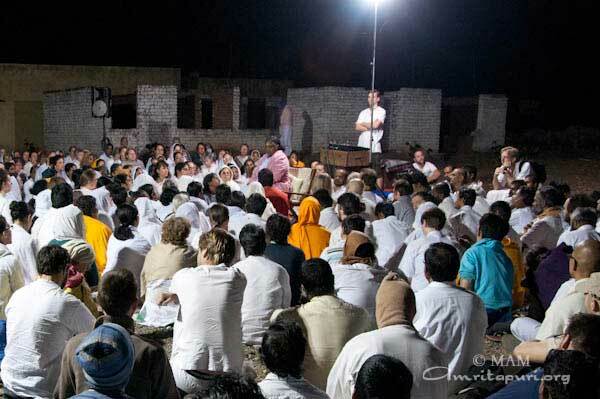 All reflected on the wisdom and practicality of Vedanta and digest the subtle teachings while they were having the dinner Prasad served by Amma in the cold night under the moon light sky. 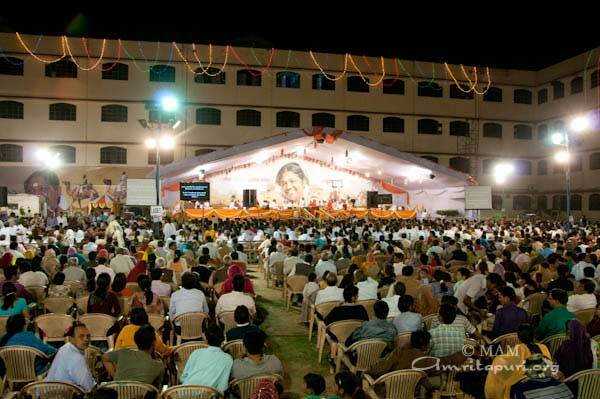 Amma held a one day public program in Jaipur, Rajasthan at the grounds of the Tagore International School. 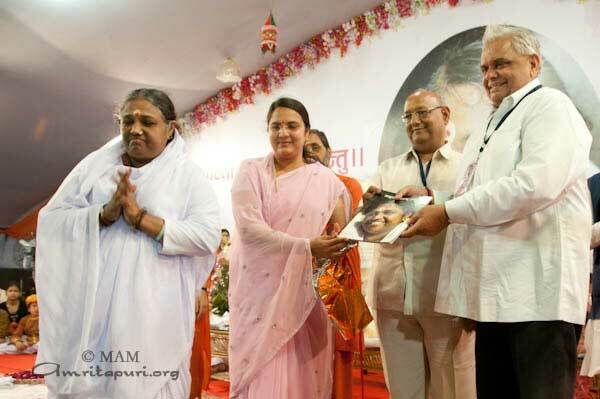 On a cool evening Amma extended her warmth and compassion to the people of Rajasthan by extending her charitable projects to those in need. 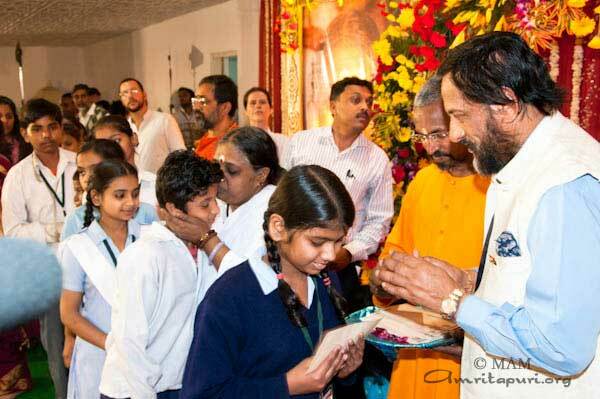 As part of the Vidyamritam program several local youth were given scholarships for their education and handkerchiefs as part of the Amala Bharatam Campaign. 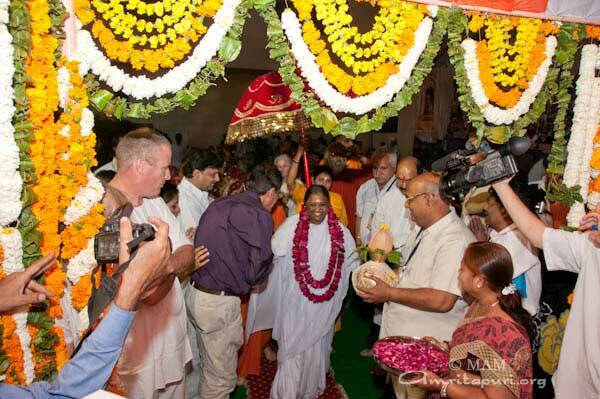 Several dignitaries were on hand to officially welcome Amma to Jaipur. Brij Kishore Sharma, Minister for Transport; Raj Kumar, Minister for Health; Jaipur Mayor Jyoti Khandelwal; Suresh Mishra, the local MLA. 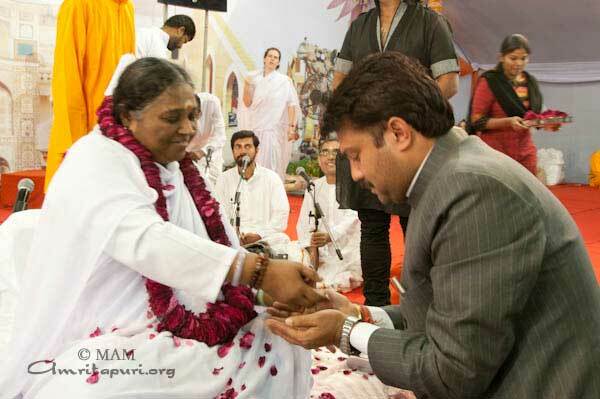 The Mayor also added, “Amma is not only awakening the god consciousness in us…. 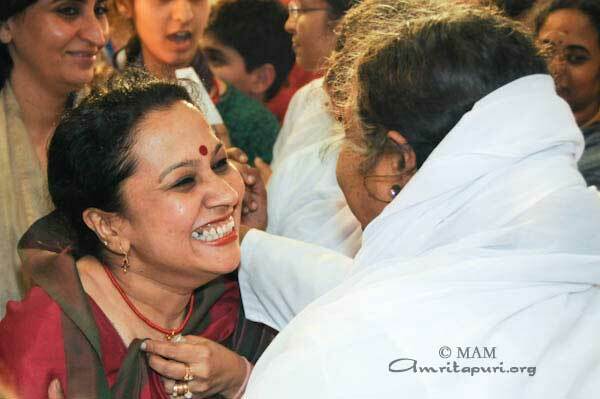 She is like a mother who teaches a child all aspects needed for one’s blossoming. 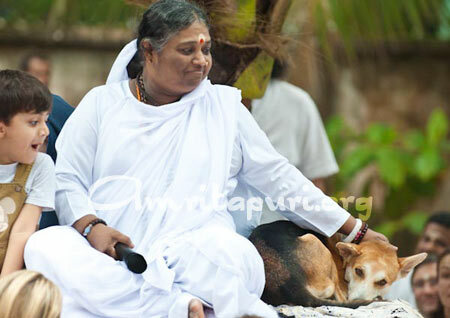 She guides us on the spiritual path and the same time teaches us how to preserve water, rainwater harvesting, ways to protect nature, etc. 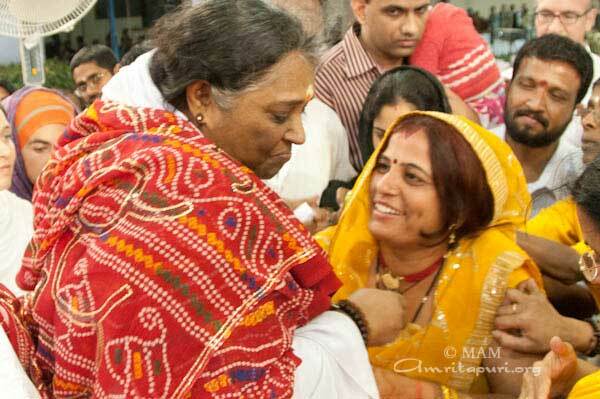 During bhajans Amma sang a song in Marwari, the local language of Rajasthan. 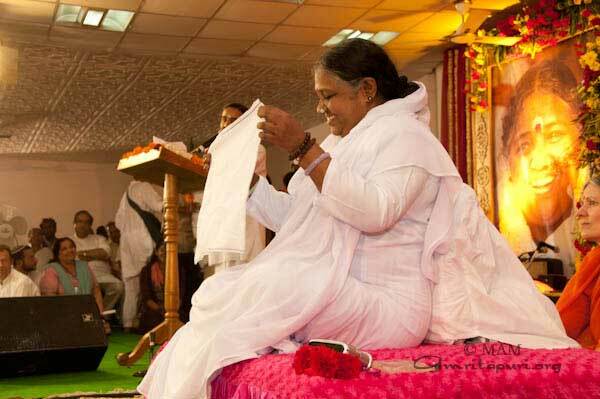 After the bhajans Amma lead the Manasa puja in Hindi. 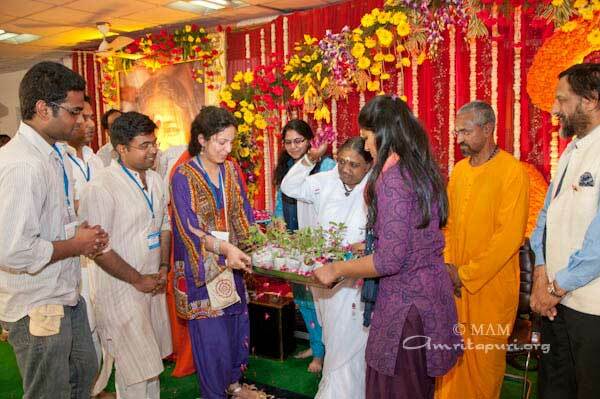 During the early morning hours an Archana was chanted for the benefit of the victims of the recent Japanese tsunami.